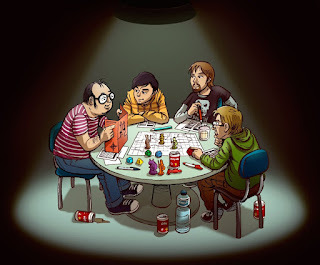 At the Mountains of Weirdness: Putting "Role" back into "Role-Playing"
I missed the OSR. I was playing. "We play dungeons, not characters". I read this slogan and found it quite funny and smart. It says a lot about the need many of us felt to go back to our roots, before games became too verbose and complicated. I fear, though, that some may take it too literally. If you start this hobby thinking you're going to play some kind of tactical skirmish game set inside a fantasy dungeon, with added gestional elements, you might want to grab a copy of Heroquest, or one of his too many spawns. Think about it: you're into something that is called "Role-Playing". I guess "Role" must play a pretty important part in the show ... say: at least 50%? I've been into a heavy storytelling for a long time and I'm the first to admit that it can get very frustrating and emotionally stressing. It's difficult for the gamemaster to prepare, relies on a generous dose of wild improvisation and suffers from a lack of real decision making for the players, because, you know ... if the story is so important usually it must go in a precise direction, whatever the players do. That is called "railroading" and if everyone agrees about its necessary evil it can be fun. We had fun with it. We played characters, not dungeons. We staged entire fictional lives. In these days, playing AD&D 1st edition, in its Astonishing Swordsmen and Sorcerers of Hyperborea incarnation, I'm looking at simplicity and fun. This doesn't mean that I renounced playing NPCs or that my players have blank stereotypes instead of PCs. Things can be done with measure. Balance is the mother of success (and good fun). Use the first person and have your players use it. No: I ask the barkeeper for some beer. Yes: "Hey you! Bring us some beer!". Just that. It hasn't to be acting. Remove the third person filter: it can be very very liberating. Promote 1 by having the group joined by a couple of NPCs who interact with them in the first person and have very distinct personalities. They can be your active voice in the game, which is useful too. Lights out. Play by candle light. Visual distractions have to be removed. You don't want your players commenting your book collection while you try to set a mood. Only the table has to be visible. Use music. Once I had a lot of spare time and noted single songs for every scene. Now I don't and use mostly background music. In the Spotify era this is much simpler than it was in the 90's. You need artist's names? Just write me. The best hing? We can have dungeons and characters and be very happy about them all. Interesting ideas. I sort of flip back and forth between 1st and 3rd person. I would use music more but I personally find it distracting as a GM, so it is only for certain moments. Enjoying your blog! Thank you Jeremy! Really glad you have a good time reading it. Hope I can keep it interesting. I'd like to write a series of posts about my ongoing campaign, dunno if they could be of interest outside of my gaming group. As for music i'm so used at having it play in the background that I'm almost unable to gamemaster without it ... the same goes for candles and cigarettes .. so I guess I'm just a bit too needy! With platforms like Spotify and bluetooth speakers now it's very easy to have your music wherever you play. I find it useful to create playlists based on moods, situations: scary, battle, anxious, sad, light, etc. so you can start it very fast only when you need it. Tema Semplice. Immagini dei temi di billnoll. Powered by Blogger.